Ever show up at a party dressed to the nines only to find that someone else was wearing the same outfit as you? Awkward! But don’t be too embarrassed. Something like this happens in nature all the time. Different creatures sometimes face very similar problems and environmental pressures, like getting from point A to point B or protecting themselves from predators that hunt a certain way. Faced with the same challenges, two (or more) groups of organisms may arrive at the same solution independently and develop adaptations that are similar in form or function but weren’t found in their last common ancestor. This phenomenon is called convergent evolution (say that to your next dress twin), and you can see it all over. Here are just a few examples. 1. 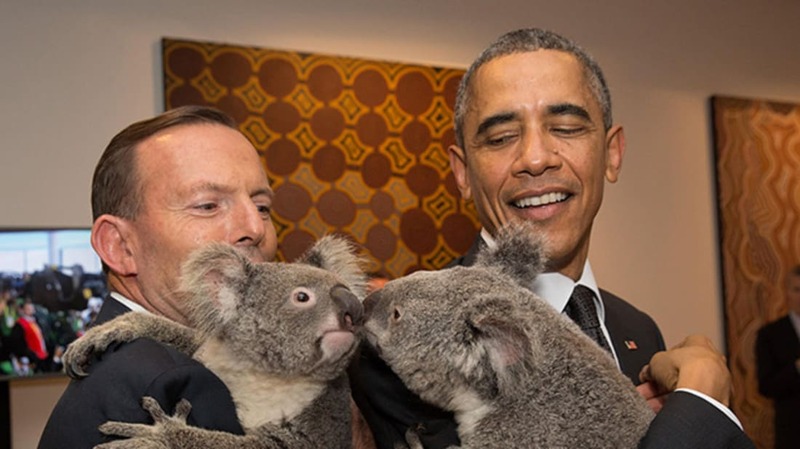 HUMANS HAVE FINGERPRINTS … AND SO DO KOALAS. The scientists think that koalas’ ridges developed fairly recently in their evolutionary history, as most of their close relatives don’t have them, and suggested they might be an adaptation for grasping and manipulating the koala’s favorite food, eucalyptus leaves. Though to be fair, scientists are still trying to figure out why we have fingerprints, even though they don’t appear to improve our grip. One of the clearest examples of convergence is flight in birds and bats. The two groups aren’t closely related; they descend from non-flying ancestors and developed the ability to fly independently. In both cases, their forelimbs morphed over time into wings, but in different ways. Bats took to the air using a membrane (called the patagium) attached to their body, arms, and elongated fingers, while birds’ wings consist of feathers extending all along a forelimb whose finger bones fused together to create a different shape. Flying insects, meanwhile, developed their wings in a whole other way. With no internal skeleton to tweak like birds and bats, their wings came from modifications to their exoskeletons. Bats share another adaptation with a different, much larger animal. Both bats and the toothed whales echolocate, meaning that they emit high-pitched sounds and listen for the echoes in order to navigate and hunt. Bats produce their echolocation calls with their larynx and emit them through their mouth or nose, while whales pass air through their nasal passage to push vibrations out from a fatty tissue called the melon. Interestingly, this same tactic has evolved in two very different environments: the sea and the sky. Even more amazing is that echolocation arose independently in each group and is done in different ways, but works thanks to the same genetic mutations. Two studies (independently conducted and appearing in the same issue of the same journal—talk about convergence) showed that bats and whales have experienced the same changes to a gene involved in sound processing, allowing them each to better hear the ultrasonic frequencies used for echolocation. The Northern short-tailed shrew and the Mexican beaded lizard are two animals you wouldn’t want to be bitten by. Both are venomous, and the toxins in their saliva can cause respiratory failure. While the species rely on two different toxins to give their bites some bite, both poisons evolved from the same digestive enzyme through very similar changes. In both species, the enzyme went through “almost identical” alterations, giving rise to two distinct toxins that do the same job. Convergent evolution isn’t just limited to two types of animal. It can also happen with species that are in entirely different kingdoms of life. This is the case for a plant called the bird's-foot trefoil and the burnet moth caterpillar that feeds on it. Both the plant and the caterpillar protect themselves from predators with cyanide. The trefoil uses a trio of genes to convert a pair of amino acids into two cyanides. The caterpillars can absorb the plant’s poisons when they eat its leaves and use them to protect themselves, but researchers have found that caterpillars that don’t feed on trefoils contain the same toxins—which means they also make them themselves. What’s more, the caterpillars produce the toxin in almost the same way as the plant. Scientists found that the caterpillars use a different group of three genes to turn the same starter chemicals into the same cyanides using the same chemical reactions. This is, the researchers say, the first example of identical biosynthetic pathways evolving convergently in two different kingdoms. Tens of millions of years before butterflies appeared, another animal was doing a pretty good impression of them. Kalligrammatid lacewings were insects that flitted around Europe, Asia, and South America during the Mesozoic Era. They weren’t the ancestors of butterflies, but were strikingly similar to them in shape, coloration and, scientists think, ecology. Looking at lacewing fossils earlier this year, scientists found that one species, Oregramma illecebrosa, had patterns on its wings very similar to those of the modern owl butterfly. The researchers think they served the same purpose: mimicking the eyes of a larger creature to scare off predators. The two groups of bugs also evolved similar-looking long proboscises for getting the same food—nectar from plants. Even though the flowering plants butterflies feed on didn't exist back in the lacewings’ day, they seem to have hit on the same tool for tapping a different set of plants during a very different time. Convergent traits don’t always show up in organisms that are as wildly different as bats and dolphins or caterpillars and plants. Sometimes multiple members of the same lineage independently develop a new trait that their common ancestors didn’t have. Scientists used to think that the adhesive toes many geckos use to scale vertical surfaces evolved once in their common ancestor, but it turns out that the wall-crawling lizards all developed the trait on their own time and time again. Recent research suggests that adhesive toes evolved at least 11 separate times across the geckos’ family tree. The adaptation appears to have been ditched almost as often; it was independently lost on nine occasions. In another case of convergent evolution happening in the same group, two populations of the same cricket species converged on the same trait in different ways. About 10 years ago, field crickets on the Hawaiian island of Kauai started to go quiet. It’s not that they were just choosing to stay mum; they’d lost the ability to chirp because males were being born without sound-producing structures on their wings. A few years later, crickets on the island of Oahu similarly went silent. At first, scientists thought that the trait—dubbed “flatwing”—had spread because of quiet crickets making their way from one island to the other, but a look at the crickets’ genes revealed convergent evolution in action. The two populations had stopped chirping independently, with two different genetic mutations leading to two different, modified wing shapes and the same outcome—silence. But why go quiet? The crickets are sometimes targeted by a parasitic fly, which follows the cricket’s chirp to find them and lay its eggs inside them, eventually killing the host. The silent treatment seems to protect the crickets from the fly.